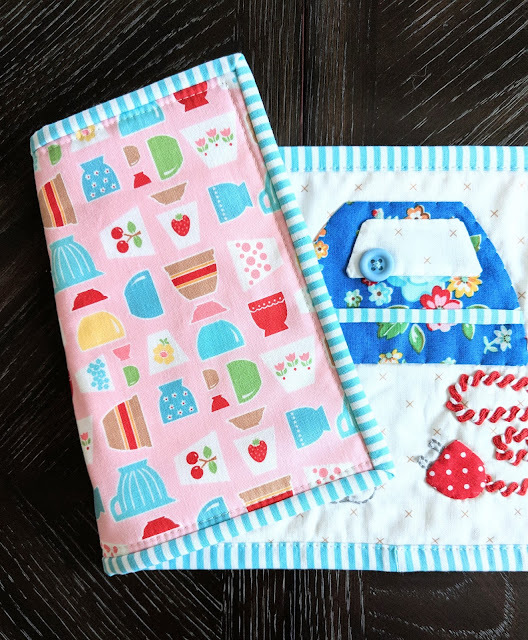 Today is my stop on the Let's Bake Sew Along, hosted and created by the amazing Lori Holt. 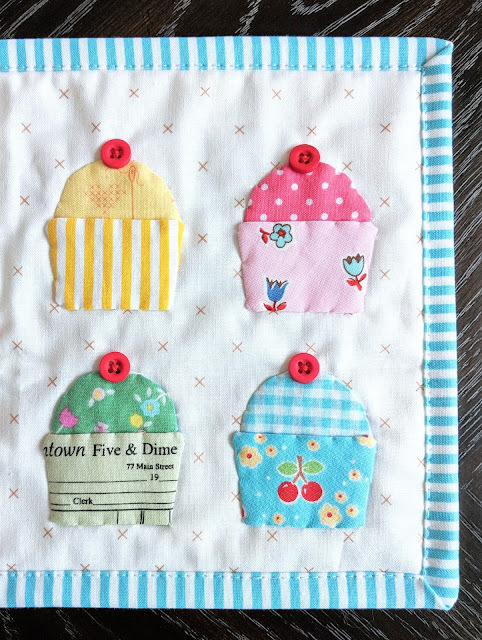 These sweet little blocks feature ingredient canisters, a hand mixer, and a quartet of cupcakes. They're from another one of Lori's beautiful applique quilt patterns, and I decided to turn them into a runner for our breakfast nook table. I used a mix of prints from several different Riley Blake designers as well as some RBD basics to get the eclectic look I love so much. 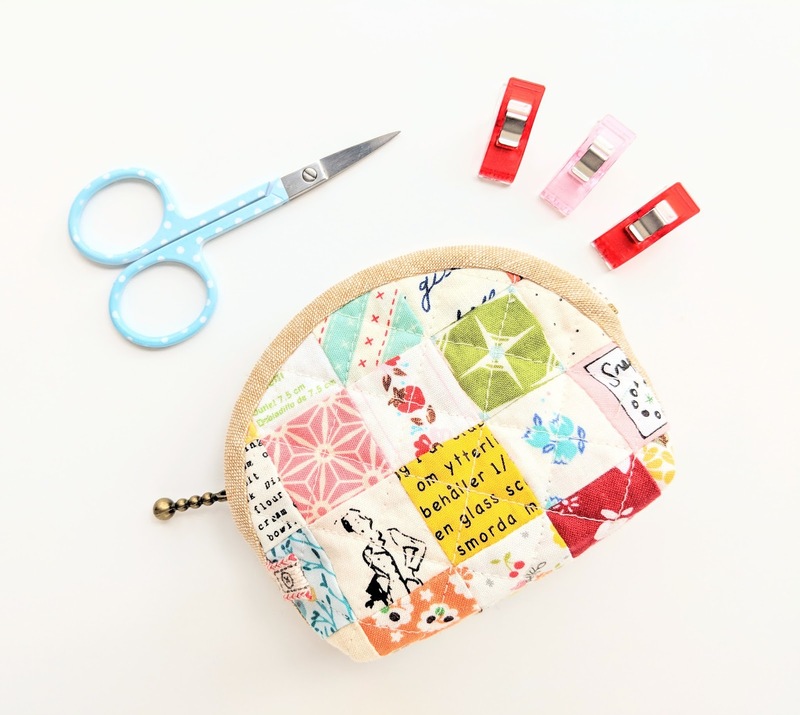 It was a surprise to me how small these pieces are -- the individual blocks finish at about 6" square -- and this makes the project go quickly, even with the hand sewing. Applique is something I very rarely attempt but always enjoy. Adding extra touches like a ric-rac "cord" and "cherry" buttons just make this piece so much fun. I made a few changes from the original pattern. There is no ric-rac at the top of the cupcake liners because I forgot to order it in time, and I only made 4 cupcakes instead of 6 so that it would fit more neatly on the runner. I also fussy cut a few words from Lori's adorable recipe print for the canister labels instead of embroidering the words from her pattern. My daughters thought "Doughnuts" and "Cookies" were a great idea! The runner is backed in a mixing bowl print from Lori's Bake Sale 2 collection. It's a perfect match for the front of the runner, and I love the way it looks with a frame of aqua and white striped binding. It's been a goal of mine to make seasonal runners for the little table where my girls eat breakfast every morning, so it feels great to add another one to our growing collection. 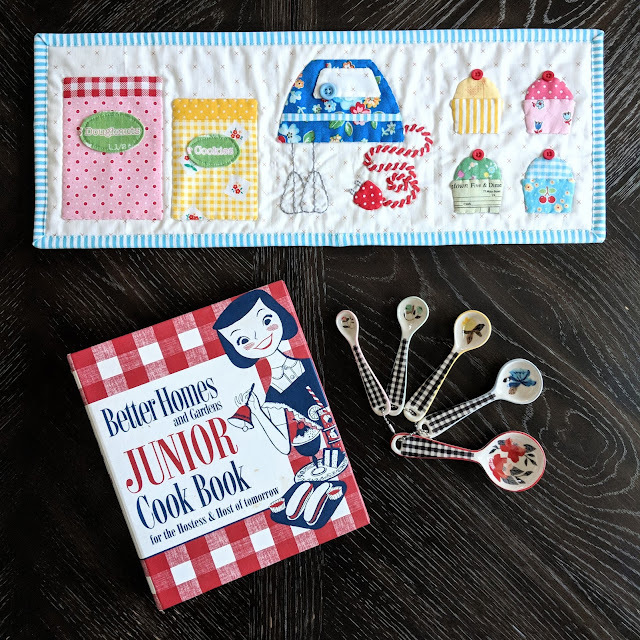 Baking is one of my very favorite things to do, and now that my daughters are starting to help out in the kitchen more often with me, I know they'll be thrilled to have this reminder of those special moments in front of them every morning when they wake up. 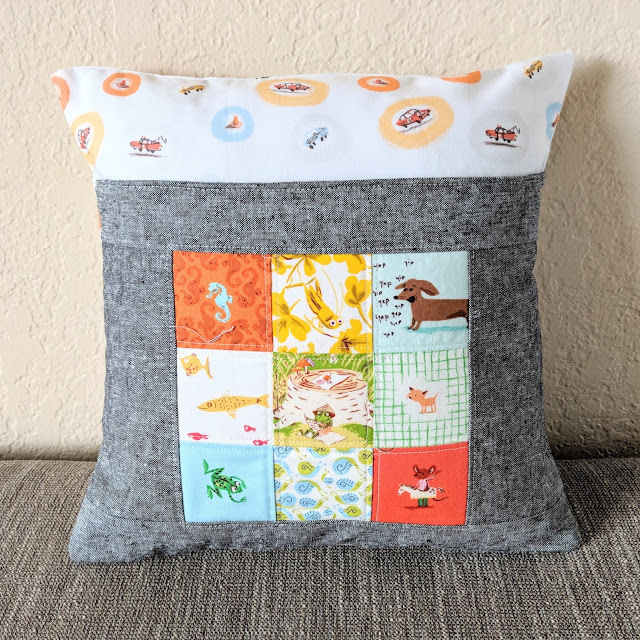 One of my favorite presents to make for both new parents and little children is a small version of the giant Book Nook pillow from my book. 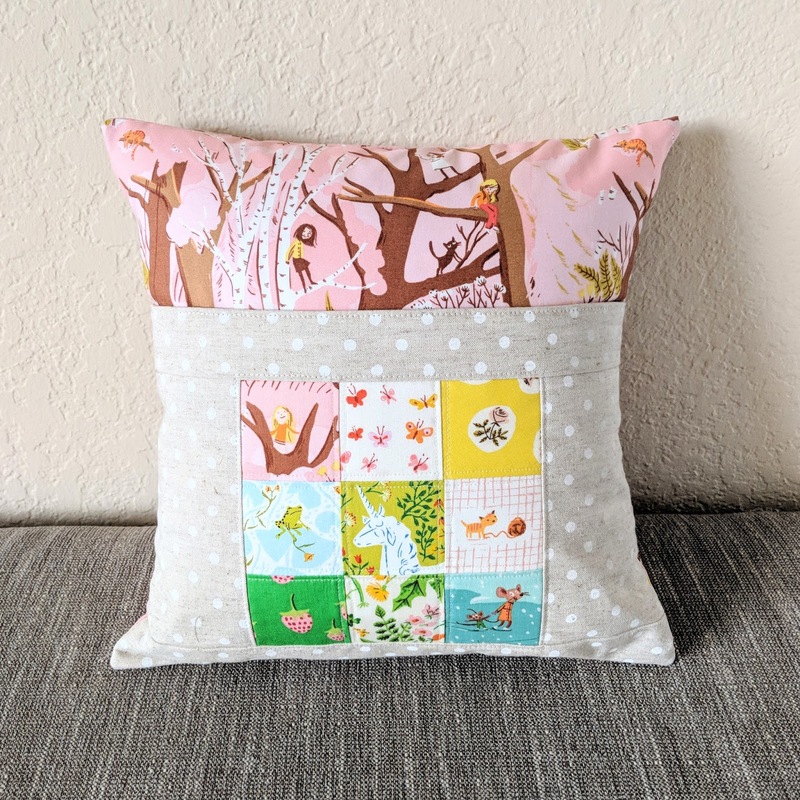 I shrink the pattern down to fit a 12" or 14" pillow form and tuck a card in the pocket for a sweet gift. 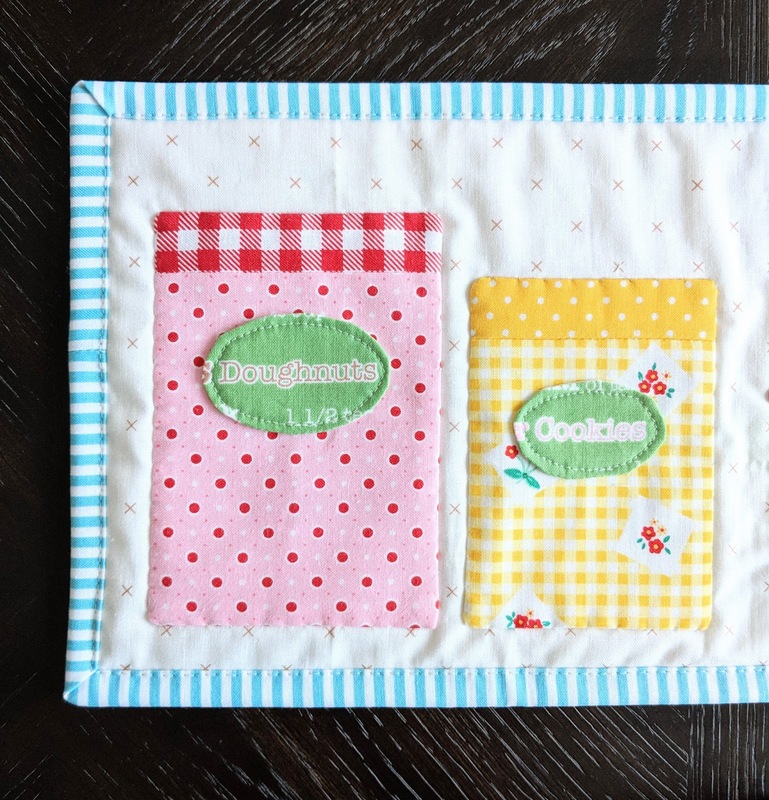 As a new mom, I always liked having lots of pillows nearby to help me get into a comfortable position when I was feeding the baby, and that pocket is a great place to stash a book or snack pack or anything else I might want when I'm up by myself in the middle of the night. For a child's gift, you can still tuck little books or toys in the pocket, and it's perfect for travel. 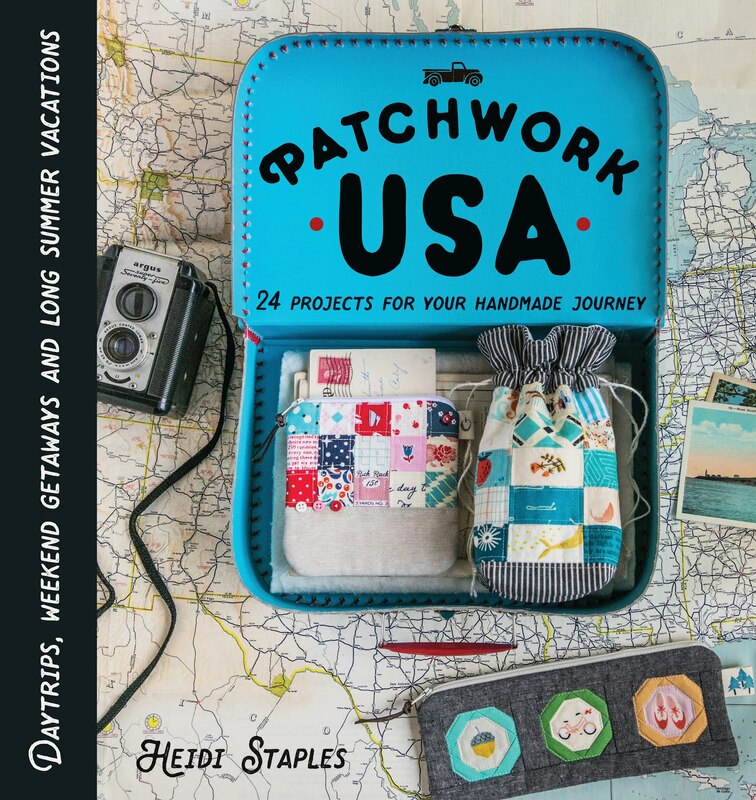 My girls and I will be making a mini Book Nook for each of them to take on our family road trip this summer. I decided to pull out my Heather Ross stash for these pillows, carefully choosing my prints since one is for a girl and the other for a boy. 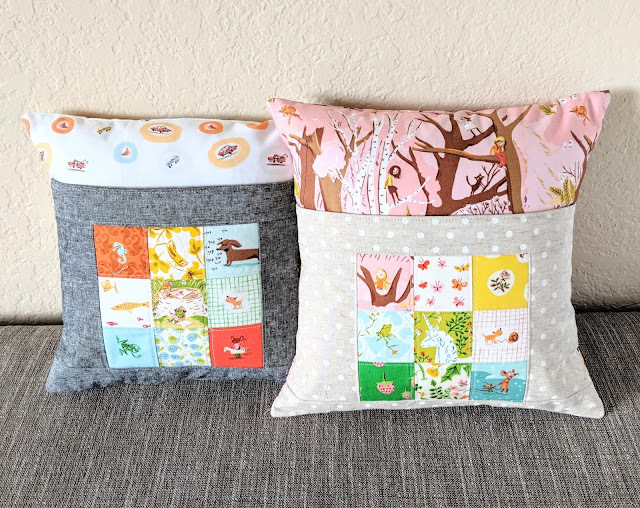 It was so much fun to pick out the fabrics for these! I paired them both with different shades of linen on the pocket background fabric for a nice contrast. I've started sewing up my own gift bags lately, riffing on the 5-Minute Party Pouch from Ruby Star Wrapping by Melody Miller & Allison Tannery. I just change up the size as needed. It's a great way to use fabric from my Five & Dime stash, and it makes the gift so much more personal. And frankly, considering how expensive gift bags are becoming, I think I'm at least breaking even on the cost! 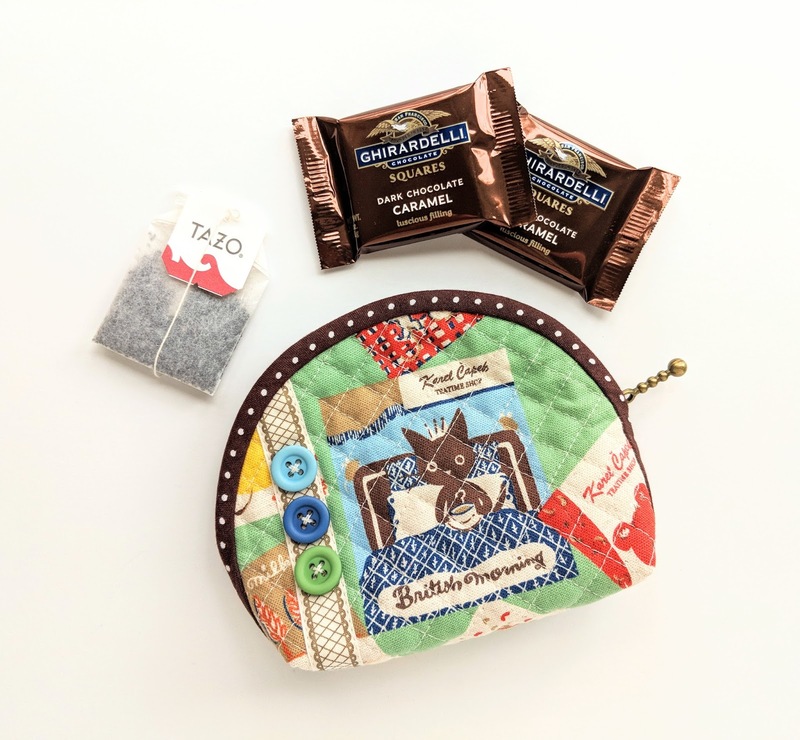 I also had the chance to host a week of my friend Kim's sew along for her new Notions Pouch pattern. 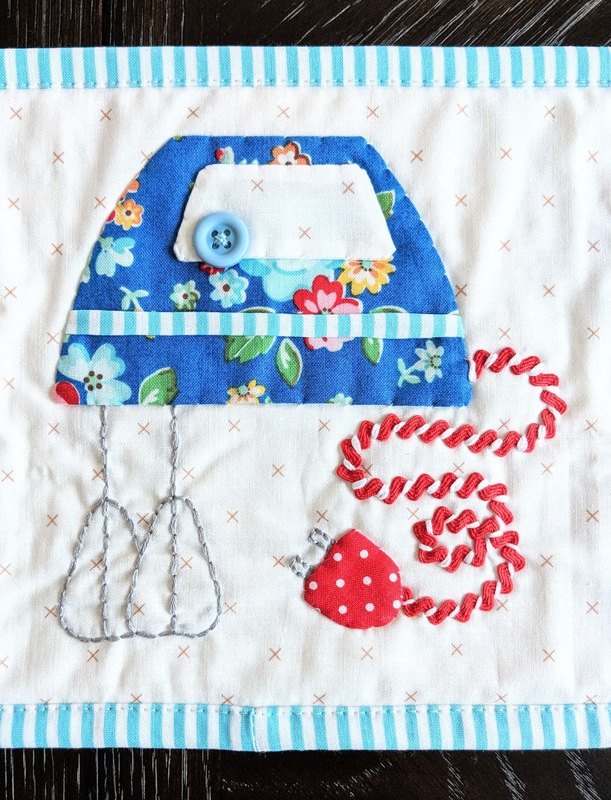 Kim is also known as Retro Mama, and she makes the most adorable things! This is just the cutest little pouch you ever saw, and I had so much fun making one in each of the two sizes she offers. The sew along is just wrapping up on Instagram -- just check out the hashtag #notionspouchsal to see all the amazing makes. Speaking of Instagram, I'm trying to keep up with the annual Instagram Quilt Fest hosted by Amy of Amy's Creative Side this month. 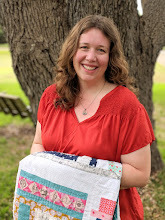 There's a photo prompt for each day of March to share with the hashtag #igquiltfest, and it's given me the chance to go back and revisit some favorite makes as well as share a behind-the-scenes look at my own sewing studio. Check it out if you get the chance. These are the kind of events that really bring out the friendly spirit that I love most about the online quilting community.